The badlands lurch up above the river, and show the signs of having once been lush forest and river lands themselves. Now dry and shattered, they are known to be home to a few minor tribes of goblinoids who generally war among themselves instead of bringing their trouble to Baraloba and the area. Few know that only a few miles from the river a black citadel has been built up from the slate wastelands – a marshaling point for the goblinoids under their new leadership. On the north edge of the hex is the cave home of a small tribe of hill giants who once hunted the goblins of the area but who know work among them. On the southern edge of the map is a small fort built into the edges of the Honeyed Forest by an enterprising knight who is working to tame both the badlands and the forest (but who is actually working for the same master as the goblinoids and who often hides goblinoid scouts and assassins within his walls). Finally, a small hamlet continues its sleepy existence on the banks of the Golden River in a clearing in the Honeyed Forest, generally unaware of the world around it. This hex sits above the first hex (Baraloba) and to the northeast of the second hex (the Honeyed Forest) that were posted last week. On a regular 6 mile hex it would have a badlands or hills tile marker and the thin line of the river running through it, possibly with the marker of the humanoid citadel in the midst of the badlands. What is the actual name of the hex paper you are using please! 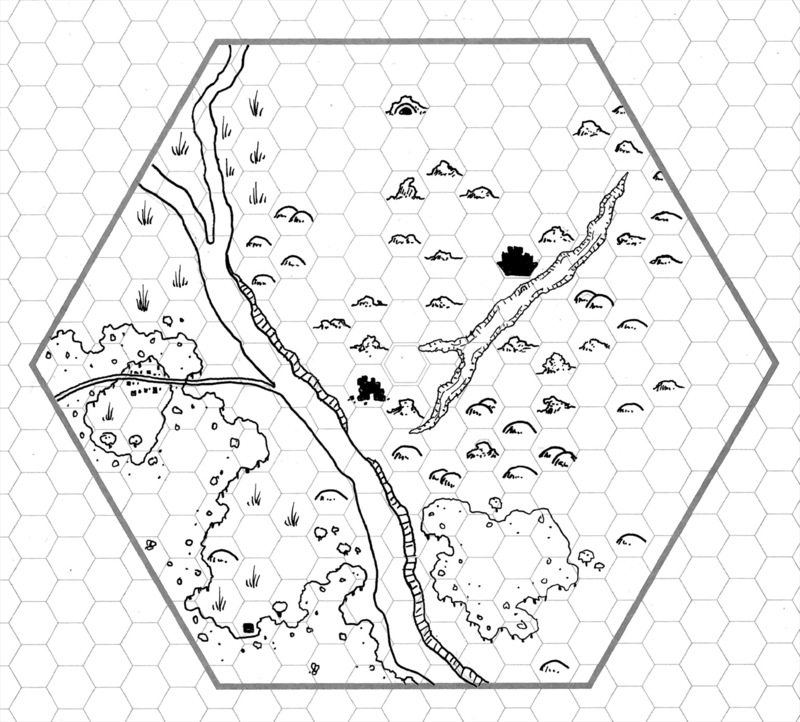 These 3 maps look good, I am converting my square hex maps to hex maps for outside and terrain maps. These sheets of big hex over small hexes look great. I like this set of maps you’ve done. I hope you’ll continue doing at least the central 7, and maybe the central 18. There’s a campaign here, of sorts, along the lines of one that a friend of mine did called “Small Hands” — based on Gandalf’s line in Bree, in The Fellowship of the Ring, where very low-powered characters had to do many clever and brave things to keep Bree from ruin during the dark days as the Shadow stretched eastward. The more clustered nature of the towns in the hex to the south now makes much more sense; there are potential raiders a day’s march and a ferry crossing away, and a more secure community with fewer outlying farms seems like good planning.